rages, depression, anxiety, eating difficulties? Highland Park Hospital—7:00 to 8:30 P.M.
Free parking in front of the hospital. Free and Open to All Caregivers. Confidential. No Registration necessary. 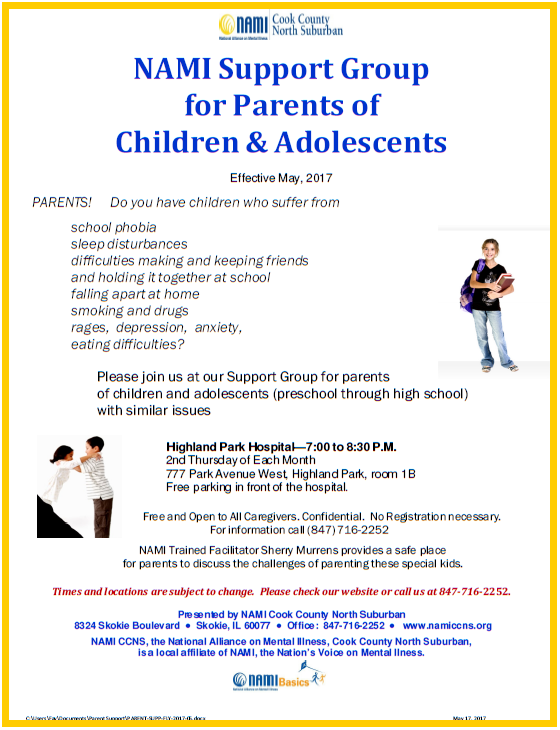 NAMI Trained Facilitator Sherry Murrens provides a safe place for parents to discuss the challenges of parenting these special kids. Times and locations are subject to change. Please check our website or call us at 847-716-2252. NAMI CCNS, the National Alliance on Mental Illness, Cook County North Suburban, is a local affiliate of NAMI, the Nation’s Voice on Mental Ilness.